Attractions in Scarborough, North Yorkshire. Scarborough SEA LIFE Sanctuary will take you on a fascinating journey from the coastline to the depths of the ocean through 12 themed zones. Discover a magical underwater world filled with a dazzling array of amazing creatures. Every step will reveal something new, from a face to face encounter with sharks to a hands-on rockpool experience. Don’t miss our outdoor exhibits – penguins, seals and otters! Visit Yorkshire’s only Seal Hospital and see how we care for over 30 rescued seals every year. Watch as we nurse them back to health so they can be safely returned to the wild. Discover the truth about the much-misunderstood shark, the plight of the endangered sea turtle, the remarkable life of the seahorse - plus countless surprising facts about these and hundreds of other incredible creatures. 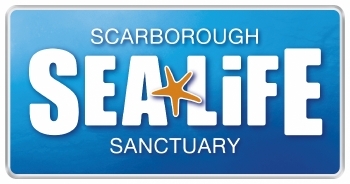 Scarborough SEA LIFE Sanctuary promises a great venue for a family day out as well as an unforgettable entertaining and educational experience. Go along to our regular talks and feeding demonstrations throughout the day, and try your hand at our Dive Adventure Quiz trail. Get closer than ever before to our colony of adorable Humboldt Penguins in their brand new walkthrough home. Penguin Island will be the first fully immersive penguin walkthrough experience for SEA LIFE Europe and will allow guests to waddle side by side to their feathered friends! Watch out for them making a splash in their babbling waterfall and don't miss feeding time where you will get up close and personal in this no barriers unique experience.